In this context we define semantic data cubes as data cubes encoded and approached with 'semantic web' technologies. The Resource Description Framework (RDF) as a data model for statements to express anything about anything in a way that is exchangeable and machine processable. The RDF Schema Language (RDFS) as a common way to attach semantics to parts of an RDF statement. Specifically, the RDF Data Cube Vocabulary as a way of expressing the specific properties and characteristics of data cubes as well as specific observations in RDF. We’ll also briefly touch on the Simple Knowledge Organization System (SKOS) in this context. In the next sections, we will elaborate on each of the above, and continue to build on the Olympic Games example that we also used to explain the fundamentals of data cubes. We will also introduce Turtle as the syntax to encode RDF statements. The Resource Description Framework (RDF) is a domain-independent framework for expressing information about resources, intended for machine processing and exchange on the web. Resources can be anything, including documents, people, physical objects, and abstract concepts. In our example, countries, editions of Olympics, medals, gender, athletes, disciplines, and so on, are all resources that we can refer to and make statements about. The subject is the thing, the resource the statement is about. This resource has a property or relationship (called predicate), of which the value is the object. Because RDF statements consist of three resources they are called triples. <USA> <has_area> 9,833,520 km2 . A particular resource may be the subject of one triple and the object of another. This makes it possible to find connections between triples, which is an important part of RDF's power. Properties are also resources. They are a bit special in that they express some kind of relationship between two other resources, but other than that they are resources just like the subject and object. We need a way of identifying resources unambiguously for machines to be able to process this and establish correct (sensible) links between the data they are given, and also to re-use resources that have already been identified (by ourselves or by others). To identify the subjects, properties, and objects in RDF statements unambiguously, the following techniques are available: URIs and literals. The URI (Uniform Resource Identifier) can be a URL (Uniform Resource Locator) as is used for web addresses, but any kind of unique identifier will do. The URI just identifies a resource, without implying the location of that resource or how to access it, however it is common and recommended practice in the Linked Data world to use http(s), and also to use wording that is to a reasonable extent meaningful for human interpretation. Literals are basic values such as strings, dates, booleans, and numbers. Literals can only be used in the object position of an RDF triple. To allow correct parsing and interpretation, literals are best associated with a datatype, and strings can also optionally be associated with a language tag. We use <http://dbpedia.org/resource/United_States> as the URI to refer to the United States. This is the id as used by DBpedia, the linked data version of Wikipedia. Try it out – load the URL into a web browser and see what you get: a document that describes the United States. In this case we used an existing URL, and by doing so we establish a link between our statement and the DBpedia statement and everything that has already been said there and in other places the reference that same URI. We could also assign our own if we had good reasons to do so, but if a suitable URI already exists, re-using it creates extra added value. We use a special RDF property to say that “United States” is a resource of a certain “type”: <http://www.w3.org/1999/02/22-rdf-syntax-ns/type>. This property has been defined in the RDF specification, precisely to be able to indicate that a resource belongs to a class (we’ll explain classes later). As value of the type property, we use another class identifier from DBpedia: <http://dbpedia.org/ontology/Country>. Load the URL into a web browser if you want to see what information is available on that class. We use a common vocabulary called RDFS (again, more on that later) to say that the resource with id <http://dbpedia.org/resource/United_States> has a “label” property <http://www.w3.org/2000/01/rdf-schema/label>. The value of that label in Dutch (@nl) is declared to be the string Verenigde Staten. As may already be apparent from the examples above, when we start making multiple statements related to the same subject, things can quickly get quite verbose and lengthy, and we also see the same URIs being repeated entirely or partially quite often. To reduce this verbosity and make the statements more readable, a more compact syntax is available in the form of Turtle. Prefixes: to avoid repetition of the common parts of URIs, a prefix can be specified once and then used instead. If several triples have the same subject, they can be grouped and the subject can be stated just once, followed by each of the predicates and objects, separated by ';' (semicolon). If several triples have the same subject and predicate, all of the different objects can be stated as one series, separated by “,” (comma). We will use Turtle as the syntax for our examples from here on forward. While RDF provides a way to make statements in triple format about resources, it does not however make any assumptions about what those resources represent. RDF in itself is domain-free. To apply RDF in your domain, you need to specify “the things” you want to talk about and the properties and relationships of relevance. In RDF-speak this translates into defining the classes and properties to be used in your RDF statements to describe your resources. Such a group of domain-relevant classes and properties are referred to as a vocabulary. The RDF Schema Language (RDFS) is what is used to define such vocabularies. Fortunately there is already a vocabulary for describing statistical information and data cubes, and what’s more, it is a W3C standard: the RDF Data Cube vocabulary. Unit Not in RDF Data Cubes but can be found in other vocabularia, e.g. QUDT. A qb:DataSet has a qb:DataStructureDefinition that defines the structure of the cube. The structure is specified by means of a qb:ComponentSpecification containing a number of qb:ComponentProperty sets, detailing qb:DimensionProperty to define the dimensions of the cube, qb:MeasureProperty to define the measured variables, and qb:AttributeProperty to define structural metadata such as the unit of measurement. The observations themselves are included as a qb:Observation for each cell of the cube. For those who are interested to know more of the technical details, each of these classes has a formal semantic definition in the RDF Data Cube vocabulary specification. We’ll limit ourselves to just one example here: the definition of the Observation Class. The subject of our statements here is the resource identified as qb:Observation. 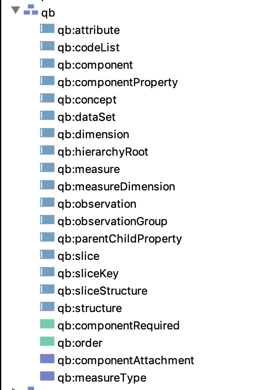 We use rdf:type to say that qb:Observation is a resource of type rdfs:Class. With rdfs:comment, we add a human-readable description of qb:Observation. We use rdfs:isDefinedBy to indicate that qb:Observation is a resource described by the vocabulary known as <http://purl.org/linked-data/cube>. We use rdfs:label to assign the literal string “Observation” as the label in English. qb:Observation is an rdfs:subClassOf the resource known as qb:Attachable. qb:Observation is an owl:equivalentClass of the resource known as scovo:Item. Omitting the prefixes for a moment, the use of subClassOf means that every instance of an Observation is also an instance of the class Attachable (an abstract superclass for everything that can have attributes and dimensions.). The use of equivalentClass means that every instance of an Observation is also an instance of the class Item defined in another vocabulary called The Statistical Core Vocabulary (SCOVO, meanwhile deprecated), and conversely every such Item is also an instance of Observation. Again, more technical details are available in the RDF Data Cube vocabulary specification. Note a small but important detail here: the lowercase letter d in dataSet. Earlier we mentioned qb:DataSet with a capital D, which is the class for data cubes. Both qb:DataSet and qb:dataSet come from the same vocabulary, but the class qb:DataSet does not equal the property qb:dataSet – they are different things! The subject of our statements here is the resource identified as qb:dataSet. We use rdf:type to say that qb:dataSet is a resource of type rdfs:Property. With rdfs:comment, we add a human-readable description of qb:dataSet. We use rdfs:isDefinedBy to indicate that qb:dataSet is a resource described by the vocabulary known as <http://purl.org/linked-data/cube>. We use rdfs:label to assign the literal string “data set” as the label in English. There is an owl:equivalentProperty which is scovo:dataset. The subject :X of the triple becomes an instance of class qb:Observation (as specified by rdfs:domain). The object :Y of the triple becomes an instance of qb:DataSet (as specified by rdfs:range). If :X qb:dataSet :Y then also :X scovo:dataset :Y, and the reverse is true also (as specified by owl:equivalentProperty). We’ll very briefly elaborate on SKOS, and we’ll also touch on SDMX (Statistical Data and Metadata eXchange). Values for dimensions within a data cube must be unambiguously defined. This can be achieved either by assigning data types to values to make sure they are correctly specified and interpreted, or by defining codes in code-lists in order to create controlled sets of values. Sometimes such code lists will already have been defined and may be suitable for re-use. If however you need to define your own lists, the Simple Knowledge Organization System (SKOS) is the recommended way to define both the codes and the code lists, where codes can be defined as skos:Concept, and the code lists as skos:ConceptScheme or skos:Collection. SKOS can also be used to define hierarchical code lists, thereby enabling aggregation of data in cubes. Those who are keen to know more of the details of SKOS should add the SKOS primer to their reading lists. Notice the relationship (skos:hasTopConcept) for relating the controlled list with the concepts and skos:inScheme for the other way around. The model underpinning the RDF Data Cube vocabulary is compatible with the cube model that underlies SDMX (Statistical Data and Metadata eXchange), an ISO standard for exchanging and sharing statistical data and metadata among organizations. The SDMX standard includes a set of content oriented guidelines (COG) which define cross-domain concepts, code lists, and categories that support interoperability and comparability between datasets by providing a shared terminology between SDMX implementers. A community group has developed RDF encodings of these guidelines. While these encodings do not form part of the RDF Data Cube specification, they are however used by a number of existing Data Cube publications. More information on SDMX and specifically how it relates to the RDF Data Cube vocabulary is available in the RDF Data Cube vocabulary specification.